Upon entering the National Infantry Museum at Fort Benning, Ga., a patron walks through an exhibit that highlights the “Last 100 Yards” of battle. The exhibit portrays the Infantry’s history of fighting an enemy within 100 yards — the most complex area of the battlefield. Clausewitz wrote about the uncertainty of such close combat while Sun Tzu concluded that it is best to subdue the enemy without fighting at all.1 As young officers and NCOs deduce that battle is uncertain from reading these classics on warfare, we as leaders fail to assert to them that although close combat is predominately uncertain, we must not avoid preparing our units for it. This avoidance is pronounced in the risk-averse manner in which we train. In combat, our Soldiers are asked to manage the chaos of fighting the enemy within this short range, but our range regulations, live-fire scripts, and range-paddle approach to training convey an unwillingness to prepare them. 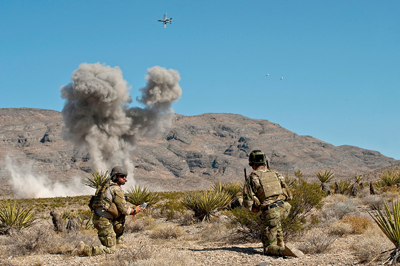 An area of training pertinent to close combat is the integration of external assets to the direct firefight. External support, such as artillery, close air support (CAS), and rotary-wing close combat attack (CCA), provides the most firepower available to an on-scene commander. Training that restricts employment of “danger-close” fires avoids preparing commanders with our chief advantage in the last 100 yards. This article intends to stir dialogue of our current approach to training on this tactic and proposes an increased depth of analysis of danger-close fire missions beyond our current doctrine that narrowly determines danger close exclusively by weapon, ammunition, and distance. Gaining the edge at the right moment is paramount in the risky and uncertain nature of close battle. Managing the battle in these moments requires realistic training that must go beyond simple statements in doctrine. Army Field Manual (FM) 3-21.10, The Infantry Rifle Company, states, “[i]f required, the company commander can even call for artillery fires right on his company position using proximity or time fuses for airbursts.” Although our doctrine outlines the idea of using fires danger close to one’s own position, it is not adequately trained or thoroughly analyzed in the Army today. Furthermore, joint manuals clearly state that danger-close fire missions are permitted in combat but forbidden in training. Allowing a commander to call fires on his position in combat but not accepting the risks to properly train him to do so seems irresponsible. With a combat-experienced Army and technological advancements in weapons and ammunition, opting for artillery “on my position” is not the most prudent use of fires available to the commander. Excessive restrictions on training danger-close fires is an insufficient approach to properly preparing commanders for this decision, which can be the difference between life and death on the battlefield. These fire missions are more nuanced and complex than the weapon system, ammunition, and distance from friendly forces that determines if a fire mission is danger close. Before addressing the improper approach to danger-close fire missions, we must first define the term according to doctrinal manuals. Army Techniques Publication (ATP) 3-09.32, JFIRE: Multi-service Tactics, Techniques, and Procedures for the Joint Application of Firepower, is a compilation of field manuals from all services that defines danger-close fires in two ways. First, danger close is included in the “method-of-engagement” line of a call-for-fire request to indicate that friendly forces are close to the target. Second, aircraft delivery of ordnance inside 0.1 percent (1 out of 1000) probability of incapacitation (PI) distances are considered danger close. Danger close is a term that is exclusive from risk estimate distance (RED) although the RED for 0.1 percent PI is used to define danger close for aircraft delivery. Danger close is also exclusive from the minimum safe distance (MSD) utilized for peacetime training. Unfortunately, leaders may approach fire support in combat in the same manner in which the manual does: a simplistic combination of weapon system, ammunition, and distance. This results in a black and white determination of whether a fire mission poses risk to friendly forces or not. Simple approaches to combat situations can be useful, but they often lead us to create simple training focused on risk avoidance, which does not teach young leaders how to mitigate risks in combat. An indication of this tendency comes from the common cliché that we “train as we fight.” Yet due to the training restrictions on fires, the difference in distance between training and fighting can be substantial. As small unit leaders and their forward observers stand on the open hilltop of a call-for-fire range and squint through binoculars to see the impact and effect of rounds on targets, we must ask whether this properly prepares them to make decisions concerning complex problems they will face in the last 100 yards. Analyzing factors beyond those in JFIRE helps illustrate how danger-close fires can be delivered safely, with purpose, and in ways that will prevent the enemy from taking away our chief advantage of external firepower assets in close combat. The manual emphasizes the importance of understanding the RED based on the assumptions outlined in the manual, for “any change to these assumptions may significantly increase the risk-estimate distances.” Logically, changes in assumptions can also significantly decrease the RED and safely deliver fires danger close. This is important when common enemy tactics are to quickly initiate an attack within close range of our forces.2 In the enemy’s mind, this type of attack levels the battlefield to soldier fighting soldier with rifles and hand grenades because the enemy knows that we often hesitate to drop anything that could also harm our own forces. However, a well-trained combat leader should have the mindset of refusing to cede any advantage to the enemy. The quick and well-calculated decision to deliver fires danger close can turn the tide of battle, often ending a fight on terms favorable to U.S. forces, just as Moore did in the Ia Drang Valley. To bridge the gap between the doctrinal approach to fires and the reality of the danger-close fight, commanders must assess more factors than the employment of the weapon and ammunition. These factors include terrain, friendly troop disposition, proximity and type of external fires asset, location of civilians, enemy action, commander’s calculation of risk, and ultimately the intended effect of the fires. Doctrinal manuals with extensive tables outlining the RED provide only a starting point to help commanders understand the risks of bringing fires upon the enemy. The complex decision of a danger-close fire mission is simply couched in our doctrine as, “[c]ommanders and fire supporters must carefully weigh the choice…in relation to the risk of fratricide.”3 But how do commanders weigh the choice when the manual approaches this issue in unrealistic ways based on only three factors? How do we train commanders to effectively integrate these additional assessment factors in the close fight when peacetime training policies and regulations restrict the observer of these fire missions to a minimum distance of 1,200 meters from the impact zone?4 Applying the additional assessment factors to bring external fires closer to the observer will make training more realistic and effective. Terrain is the first aspect that can change the risks of a fire mission and is a significant factor when delivering ordnance. It is even possible, based on the terrain, that ordnance delivered at a greater distance from a friendly position can be more risky. For example, delivery of a 500-pound bomb within 75 meters of my own position, but at a lower elevation in a river bed, is not as risky as delivering the same bomb at 150 meters at a greater elevation from my own position along the side of a mountain. Terrain changes the risks involved. Changing the disposition of friendly troops can reduce the risks as well, namely ensuring troops are in covered positions. The JFIRE manual bases RED on three assumptions: “friendly troops are standing unprotected in the open, in winter clothing and helmet, and on a line perpendicular to the line of fire.” Clearly, combat rarely adheres to these assumptions. Troops are often in standard protective equipment, in the prone behind cover, and may or may not be perpendicular to the line of fire. When Soldiers are behind considerable cover and wearing ballistic protective equipment, assumptions of danger-close distances can change drastically along with the risks to them. Another major consideration for friendly forces is the proximity of the external asset. The manuals abstractly approach the weapon and ammunition as a system, but even with the advent of modern technology, a person with a beating heart and a thinking mind is still pulling the trigger. The proximity of that person to the battle is significant, especially when he is delivering ordnance close to Soldiers on the ground. Commanders must understand that calculating the risk of a danger-close joint direct attack munition (JDAM) delivered by a fixed-wing aircraft is much different than danger-close 30mm cannon fire from an Apache helicopter because the pilot provides additional control of the decision, further mitigating risk. MAJ Bernard Harrington, an AH-64D Apache pilot who served as the operations officer for Task Force Outfront during Operation Enduring Freedom VIII, said, “Our TPMR (technique, pattern, munitions, and range) crew brief is vital to mitigate risk when engaging danger close.”5 In addition to the selected munitions and range of engagements, aviators can apply specific techniques, such as diving fire to reduce dispersion and the risk of ricochet, dependent on the terrain. Aviators also select specific flight patterns to orient the aircraft’s weapon systems to minimize risks to friendly troops. For example, when Soldiers are danger close, aviators may execute a racetrack pattern parallel to friendly troops to minimize the risk of long or short rounds. Additionally, in today’s modern aircraft, aviators can leverage technology, such as moving maps that have the ability to store both friendly and enemy locations in an effort to further reduce risks to friendly troops during a danger-close engagement. The proximity of an asset to the battle can also help reduce the risks to civilians. Civilian considerations dictate how the commander can use fires. Significant political effects, both within the host nation country and in the U.S., may determine whether fires can be used at all. In some instances, danger-close fires might be considered reasonable because of the accurate manner in which they are delivered or because of the urgency of the situation. Clearly, a commander willing to deliver external fires close to his own troops has a legitimate need to protect them in this manner. In most instances, commanders using external assets within close range will be acting on more accurate information than when using them from farther away, for the closer the enemy is, the easier it is to identify them and distinguish them from the civilian population. To manage fires close to civilians and civilian structures near the battle, collateral damage estimates (CDEs) are an important tool for balancing political repercussions of considering the safety of your own force over the civilian population or vice versa. Ensuring the safety of your own force is paramount, but the safety of civilians outweighs the destruction of enemy forces. Weighing these factors is difficult because any decision favoring one over the other can have a positive or negative political effect that will affect the strategic environment, depending on the results of the fires. The current information technology environment can magnify these results as the rapid flow of information can quickly create a strategic effect from a tactical battle. After considering the potential effect of fires on the nearby civilian population, a commander must focus on the enemy because the decision to deliver fires danger close is based on the enemy location. We assume the enemy desires close battle to negate our advantage of external assets, namely aerial and cannon fires. As we engage the enemy at close range, a danger-close fire mission disrupts their decision cycle and can turn the tide of a battle in our favor. Conversely, rigid application of the doctrinal approach allows the enemy to exploit his intended advantage of negating our external assets through close fighting. This situation can often be the decisive point of battle for either side. Furthermore, a commander must make this decision within seconds, so it is essential to prepare him to think through a similar situation prior to the battle. This simple exercise will greatly improve his decision process. The tactics of maneuver warfare suggest forcing the enemy to compromise between the organic fires from the element on the ground and the fires from above. The on-scene commander seeks to force the enemy into a situation in which if they assault forward, they will be killed by direct fire; if they stay in their position, they will be killed by fire from the air; or if they retreat, they will be killed by both. The deliberate decision to deliver danger-close fires ensures the commander retains his firepower advantage over the enemy. The commander’s calculation of risk is key to retaining our advantages in these close contentious battles where Soldiers are aggressively degrading an enemy attack or closing on their positions. The additional factors mentioned previously, in combination with basic metrics, can help leaders make sound decisions in these situations. The important assessment from the commander in calculating risk can be determined by asking a couple of simple questions. First, are risks to friendly troops from enemy fire greater than the risk of conducting a danger-close fire mission? For example, the 0.1 percent PI outlined in JFIRE for 30mm guns from an Apache helicopter is 70 meters, the distance considered danger close. If the enemy is hurling grenades toward friendly troops, a combat leader can quickly estimate the PI for a grenade. Clearly, enemy grenades landing within 10 meters of friendly forces has a greater PI than 1 out of 1,000. Furthermore, the 10 percent PI distance, or 1 out of 10, for 30mm guns from an Apache is 25 meters, which a commander can determine is still a safer probability than the enemy grenades. Therefore, directing the pilot onto the enemy within these close ranges is a responsible decision. Some could argue that these two risks will combine to compound the risk further, but assuming this danger-close fire mission will disrupt the risk from enemy fires in exchange for the risk from our own ordnance is a more accurate assessment. Furthermore, calling danger-close fires will reduce the long-term risks since the enemy will likely continue to fight in close range if a commander decides not to use external assets to disrupt them. A second question the commander must ask is how will this fire mission affect the enemy and can it potentially change the tide of battle? This question ensures the commander identifies and weighs the intended effect of the fire mission. Analysis of the purpose is twofold. First, the purpose of the fire mission is physical, meaning the fires can destroy enemy forces, which in turn will reduce the risks to friendly forces. Second, the purpose of the fire mission is psychological, meaning the fires can disrupt the enemy and change the decision cycle of the enemy commander who may have thought that our force would be unwilling to conduct fire missions that close. The fire mission can communicate to the enemy willingness and competence to bring fires very close, even if it does not physically harm them. The twofold effect of destroying enemy forces and disrupting the enemy decision cycle can turn the tide of the fight or end the battle. Therefore, it is imperative that we effectively train our forces to confidently and competently utilize fires danger close. One way to build confidence to make decisions in close battle is to develop relationships in training that interact in the danger-close fight. Our doctrine emphasizes that full spectrum operations demand “rapid decision making” with “trust and mutual understanding among superiors and subordinates.”6 These trust relationships are amplified in close combat. SSG Ryan Pitts, a forward observer for Chosen Company, 2nd Battalion, 503rd Infantry Regiment, has directed danger-close fire missions during multiple tours in Afghanistan. He said, “Danger-close missions require effective communication and trust between the firing element or CAS platform and the observer.”7 SSG Pitts highlighted one of the relationships based on trust that is built in training and becomes tightly interwoven with other relationships in close combat. The first interwoven relationship in close combat is between the commander on the ground and the higher commander. One commander is next to the battle and makes decisions under his higher commander’s delegated authority. If the commander on the ground, which is the highest-ranking Soldier present, decides he wants danger-close fires, the trust and mutual understanding from the higher commander should unequivocally support this decision. This support should not falter if the results of that decision are not ideal. Key to this trust relationship is “successful shared experiences and training,” which is difficult to attain if training does not address the situation occurring in combat.8 This relationship often begins in training and is more important in combat. During training, both commanders can understand how each sees the battlefield and build a team that supports one another in the risky environment of combat. The second relationship is between the commander and his subordinates who are fighting the enemy together. If the commander decides to conduct a mission danger close to his own position where his subordinates are also subject to the results of the decision, they may or may not agree with his choice. Trust must fill the gap between the commander’s choice and the subordinates’ preference. Trust is built in training and experience, but training must subject the commander/subordinate relationship to the realities of risk in combat in order to truly be effective. As the relationship is tested in training, the commander can show competence in accomplishing the mission and genuine concern for his subordinates through sound decision making. The third relationship is between the commander and the external assets, commonly pilots. The perspective of the pilot or shooter is important to the commander in a danger-close environment. As with many combat relationships, the commander is literally putting his life and the lives of his subordinates in the competent hands of the pilot although the two may have never met nor has the commander personally assessed the abilities of the pilot. As the pilot hammers in rounds danger close to friendly forces, trust and mutual understanding take on a depth and breadth of meaning unmatched in other environments, yet the same pilot in training is restricted to an overly safe distance. Unique to this relationship is the requirement that the on-scene commander transmit his initials in the call for fire, which acknowledges responsibility for the risk associated with the fire mission. This absolves the pilot of the responsibility of the decision when he is following the order from the commander on the ground. When pilots follow the request for danger-close fires, the supported commander must take responsibility for the risk, otherwise the pilot may hesitate to provide support. Even when a pilot is legally absolved of responsibility when shooting close to friendly troops, he would clearly treat the mission differently than if troops are a safe distance away, but why? According to Harrington, a pilot’s professional responsibility works in tandem with the ground commander’s assumed responsibility for the risk, making the passing of initials more a method of communication. Harrington’s comments reveal another control factor in assessing risks for danger-close missions. Namely, a commander can assume that a pilot will safely execute his fire mission regardless of how close it is called in, even when he is absolved of the responsibility. This assurance resides in pilot professionalism and the commander-pilot trust relationship built through realistic and often risky training. The nature of the current war in Afghanistan necessitates training focused on the danger-close fight to build trust relationships in our ranks. Many units are organized in small elements such as platoon-sized outposts, Special Forces teams, Afghan army and police outposts, and village stability operations that all assume the risk of facing an enemy with the capability to mass and possibly overwhelm them. Risk aversion, in the form of overly restrictive safety procedures during training for danger-close fires, actually assumes more risk because it avoids the risks instead of training leaders to mitigate the risks. Instead of instilling false confidence by repeatedly telling ourselves we “train as we fight,” combat leaders must find a way to thoroughly prepare their subordinates for the reality of close battle. Leading subordinate commanders, platoon leaders, and NCOs through case studies and shared experiences can greatly increase their preparation. Coupling this with realistic training that incurs some increased risk will pay priceless dividends with the ability to save lives in combat. As stated before, the decision to deliver danger-close fires often occurs within seconds where any hesitation can quickly become a costly delay, multiplying the negative effects of the battle. To offer another perspective on safety in training, let us look objectively at the PI and MSD for peacetime training. Using the laws of probability, we can look at the alternative side of the PI. For our purposes, we will call it the probability of non-incapacitation (PI’). For the previous example of a GBU-38, JFIRE reveals the 0.1 percent PI distance for this bomb is anything 185 meters and closer, which is based on the unrealistic assumptions outlined in the manual. If the PI is 0.1 percent, then the PI’ is 99.9 percent that a person at this distance will not be incapacitated. If we change the assumptions and put an observer inside a covered position where he is completely protected, we must assume that the PI’ would be even higher. A reasonable decision would allow an observer in training to call in a GBU-38 within 200 meters of his covered position, but in training we are restricted to the MSD of 1,200 meters. In order to advocate for strict adherence to the MSD and avoid firing danger close in training, those who are risk averse will argue that close combat is relatively infrequent in modern battle and therefore does not need to be a focal point of training. On the other hand, the high potential of casualties in this situation negates the infrequency of this type of battle. Not only are the stakes high in close combat, its results can quickly have negative operational and strategic effects if high-level staffs are not prepared to properly address the civilian population, the media, adjacent units, and policy makers about the outcome. Thus far, I have pointed out the irresponsible approaches to preparing units for use of external fires in close combat. While a majority of military units conduct outstanding training that is effective, I do offer a few conclusions that challenge leaders to reassess how they prepare for close combat in terms of managing risk. First, the safe employment of danger-close fires is feasible in both combat and training. Safe employment of these fires must look beyond the weapon, ammunition, and distance outlined in the manual and view the complete picture of combat including the terrain, friendly forces, proximity of the external asset, enemy actions, civilian considerations, and the intended effect of the fires. Danger-close fires are not a simple weapon and ammunition relationship, but a command decision that weighs many factors. Second, trust and mutual understanding are built in training, expanded through combat experience, and vitally important to small units engaged in close battle. Commanders must foster this within their own units, with adjacent units, and with their supporting elements. Third, a risk accepted in training is an effort to reduce a risk occurring in combat. This is the purpose of training, and commanders must view training risks and combat risks over time as well as in singular events. Furthermore, commanders who advocate risk aversion through zero-defect leadership create riskier leaders because they are only trained and rewarded to avoid risk. When these risk-averse leaders are forced to deal with risk in combat, they do not know how to mitigate — a truly risky venture. Fourth, as chief trainers of our units, we must not primarily envision our training based on restrictions from range-safety regulations. We must first conceptualize our training based on combat, mitigate and accept risk in training as we would in combat, then address range restrictions and prudently modify restrictions as necessary. We often plan our training in the opposite order, losing vital realism and settling for risk avoidance instead of mitigation. Acceptance of risk must be well understood and supported by all leaders in the chain of command when preparing for combat. These conclusions are an attempt to continue to improve training and to retain the past 10 years of lessons from close combat. During an address to the students at the Naval Postgraduate School on 7 June 2012, Special Operations Commander ADM William McRaven emphasized that military leaders should take and accept risks and be prepared to fail in an effort to learn from experience. Likewise, a responsible venture of all leaders should be to accept risks in training in order to reduce risks in combat. 2 The author’s experience of close fighting is based on two major attacks in Nuristan Province, Afghanistan, in August 2007 and July 2008. 3 JFIRE: Multi-service Tactics, Techniques, and Procedures for the Joint Application of Firepower, 106. 4 This example is the distance based off of MSD of a GBU-38 for peacetime training. 5 MAJ Bernard Harrington, phone interview, 9 July 2012. 6 FM 6-0, Mission Command: Command and Control of Army Forces, page 1-14, para 1-59. 7 SSG Ryan Pitts, email interview, 14 June 2012.